"An incredibly unusual book that delivers; witty irony, incisive cleverness and cutting humor; hilarious and universally true in a way that will make the reader blush, cry, or laugh (or all three simultaneously); this is a memorable book in the most positive sense of the word. Highly recommended!" The Columbia Review. “Epic Sloth: Tales of the Long Crawl” by Philip Gaber is described by the publisher as “psychological fiction,” but is in fact much more than that. The book is part stories, part existential philosophical observations, and part poetry. In a testament to the author’s ability, this very unique book delivers the most common quality sought by readers: It’s exciting! The prose parts of the book are told in the disarming voice of a male character, combining an almost mundane personal reportage (i.e., daily routines, a sweet yet troubled love life scenes, and recollections of past experiences from early childhood to immature adulthood) with contemplative ponderings and meditations tossed in-between. I said the only thing I could say at that point, which was, “Wow.” And then thought the only thing I could think at that point, which was, help. I could feel my eyelids getting heavy again and I wanted to close them and go to sleep, but I forced myself to stay awake. “It’s a simple choice,” Jenny said, and she hung up. I went into my bedroom, took two Vivarin, washed them down with a Mountain Dew, and began throwing out all my camouflage shorts and Red Hot Chili Peppers tee shirts. 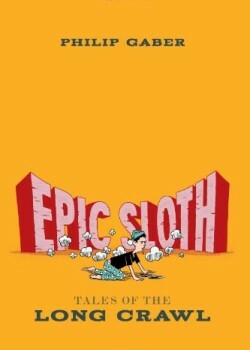 In summary, “Epic Sloth: Tales of the Long Crawl” by Philip Gaber is an incredibly unusual book that delivers short, hard punches at the reader—neither cruelly, nor lovingly, nor provocatively, but with witty irony, incisive cleverness and cutting humor that becomes addictive. Every chapter is a surprise or a shocker, either introspective, hilarious, or universally true in a way that will make the reader blush, cry, or laugh (or all three simultaneously). In short, this is a memorable book in the most positive sense of the word. Highly recommended!